Posted November 23rd, 2016 | Regulations. When selecting doors specifiers have a lot to think about – with security being a major consideration. Secured by Design (SBD) is a police initiative to guide and encourage those engaged within the design, specification and build of new and refurbished homes, commercial premises, schools, hospitals and sheltered accommodation, to adopt crime prevention measures. Trying to understand the Building Regulations can sometimes feel like navigating a maze; everything seems to refer to something else and it’s easy to find yourself going round in circles. If you’re specifying doors or windows, there are a number of regulations and guidelines to consider. Posted October 26th, 2016 | News. Posted October 20th, 2016 | News. Last Spring, Soundcraft had the privilege to work for an unusual project now featuring in Grand Designs Season 17, hosted by Kevin McCloud. 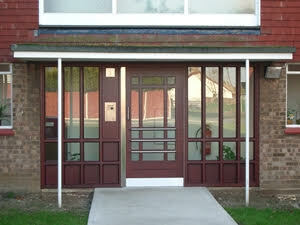 What kind of communal security door is best for my project? Posted September 22nd, 2016 | Security Doors. If you’re specifying communal security doors (CSDs) for a social housing block of flats, there are many options to choose from and deciding what kind of door to use can seem like a difficult task. Posted July 1st, 2016 | News.